pieces are available! Uber drama and perfectly on-trend! A huge ring of polished and matte concentric sterling silver diamonds with a big fat pearl at the center. Wear this baby on your middle or index finger and you'll make all the other girls uber envious! Elements: Sterling silver with a .999 fine silver and anti-tarnish finish. 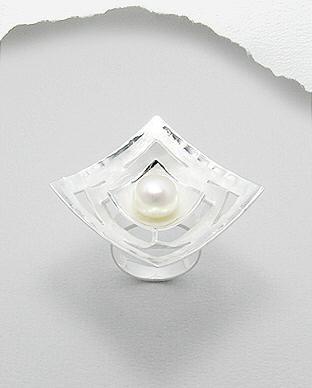 Gemstones: One white 10mm genuine freshwater button pearl.